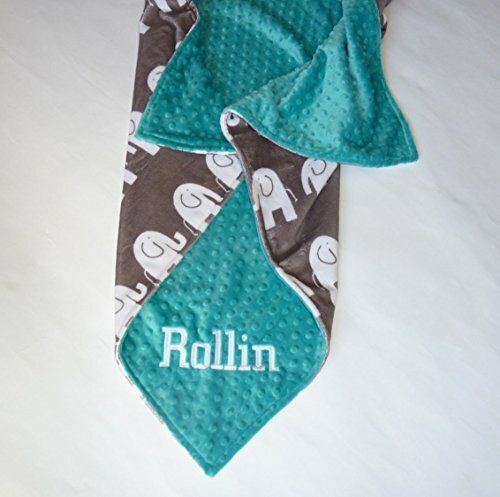 Front print is a Premier Prints Elephant in Oyster gray Minky. Blanket is backed with a dimple dot minky color of your choice. Color options can be seen in the last picture on this listing. The Dimple dot color pictured is Teal. If no Color is chosen the color pictured will be used. Blanket is embroidered with baby's name. Choose your size and name. Please double check the size to confirm you are getting the size you want. Machine wash cold, tumble dry low. No fabric softeners and do not iron minky. Please Note: The $20 Lovey (15x18") size blanket is for baby to haul around or cuddle with before they are big enough to sleep with an actual blanket. PLEASE DO NOT ORDER THIS UNLESS YOU ARE LOOKING FOR A Lovey! You cannot wrap a baby in a blanket this size, it is a bit larger than a burp cloth and is meant to comfort and play with not cover. All the other size options are for a blanket size.